Topics: Upcoming Events, What We Sell, Baby Equipment Rentals, and Consign With Us. It is hosted by Monstercommerce Llc (Illinois, Belleville,) using Apache/2 web server. ns61.worldnic.com, and ns62.worldnic.com are its DNS Nameservers. 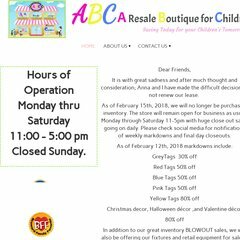 Ababyconsignment.com's IP address is 206.188.193.77.